This device may be used to either open or close the circuit at any desired time. An alarm clock is firmly fastened to a wooden bracket and provided with a small wood or metal drum, A, to which is fastened a cord, B. The other end of the cord is tied to the sCw. itch handle so that when the alarm goes off the switch is either opened or closed, depending on whether the cord is passed over pulley C or pulley D.
When the cord is passed over pulley C, as shown in Fig. 1, the circuit will be closed when the alarm goes off, but if it is passed over D the circuit will be opened. 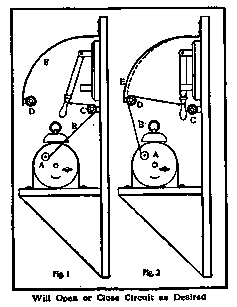 Pulley D is fastened to a piece of spring steel, E, which in operation is bent, as shown by the dotted lines, thus causing the switch to snap open quickly and prevent forming an arc. --Contributed by Douglas Royer, Roanoke, Va.